“Keep Calm and Carry On,” through injury. It was a Sunday afternoon when it happened. I was trying to make changes for turning 20 so I used different machines at the gym and went hard on the progressive overload. My legs have buckled before on me and I’ve never thought anything of it. I noticed the pain the following morning and thought I could just “shake it off,” like normal. But as the week went on, the pain got worse. I felt it when I walked and I felt it when I sat down. It actually hurt more when I lay down. There wasn’t pain when I touched it, just a constant throbbing that intensified when I lay down. By Thursday I was crying out in pain and Jana was alarmed– she’d never seen me this way before and she fetched me some medicine to get me through the night. She said “go to the doctor tomorrow whether it feels better or not because if it flares up over the weekend you’ll have longer to wait to see a professional.” Y’all this girl rocks. She’s one of my best friends out here without a shadow of a doubt. So the next day I did just that. I’d been deterred by the idea of paying for an American health bill (https://lisalaceberrie07.wordpress.com/2015/03/23/renegade-on-the-run-spring-break-2015-part-1/) because I had other and more important bills to pay; not to mention making my money stretch for the rest of my time here. But I’m insured so I decided to see what they had to say. I was there for over an hour and ever since Tuesday of that week my glands had been swelling every time I ate something. I was nearly in tears as I talked to the nurse, saying “I’m sorry I’m just in so much pain.” Because of my thyroid disorder the nurse was really worried about my swelling glands. Remember reader how I told you about how much I try not to cry? The only time I don’t mind being treated like a child is when I’m in pain, whether it be physical or emotional etc. There was some swelling by my left foot tattoo- next to the ball and socket joint and they sent me for an X-ray. We all knew there was no break there but that didn’t mean there wasn’t a fracture. The pain wasn’t coming from nowhere! 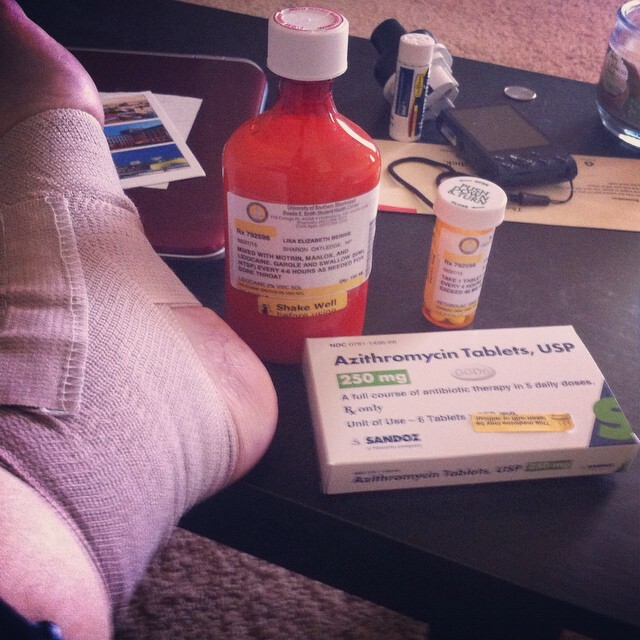 The x-rays turned out to be normal and they gave me painkillers and a support bandage for my ankle. The painkillers are really strong and give you an upset stomach as well as making you feel drowsy- yay for another problem to deal with; she says sarcastically. I got some nasty tasting medicine for my glands which I had to gargle before swallowing and more tablets for it. Walking felt a lot better with the bandage on. I avoided the gym and carried on with life as normal. The pain was still there though, not so much when I walked but when I sat down. It became uncomfortable to walk with the bandage so I wore it less often so that my foot could breathe in my shoes. I got patted down at the airport because I had the bandage on and after that I didn’t put it back on again. It was this that made me realise that the pain was further up my leg, in my calf. Each day of Spring Break it was an average pain that intensified as the day went on, the further Elizabeth and I walked. In Florida I iced it and the swelling went down a bit but the pain was still there. I didn’t worry too much- these things don’t happen to me. When they do they don’t last long. So when Maddie asked me if I wanted to work out on the last day of Spring Break, I said yes. I wanted to put my leg to the test. I survived and I thrived off being able to exude my excess energy once again. I got up early and went again the next morning. No easy job, two big monster sessions in 24 hours. I needed to burn away this excess weight that was bringing down my self-esteem. The next workout I did I felt as though something in my ankle was going to snap. I was actually slightly scared. I didn’t want to punish my body for my brain’s decisions. It was the following workout a couple of days later when the searing pain meant I couldn’t finish my workout I knew that something had to be done. I imagined if I legit lost my foot because of my perseverance and I had to have a fake leg. I swear y’all each grey hair on my head shall be well earned. I also have a tattoo on that foot. I realised if I lost my foot, I’d lose my tattoo and then I’d only have 5 (I have odd number OCD except for the number 7). *Priorities…* They recently moved the campus clinic which was hugely inconvenient, considering my injury. This time I had a different nurse and I told her about my last appointment, showed her where the pain was coming from and got new x-rays, this time on my leg. Again no breaking of bones but she said she could see the swelling to my left calf and that there was some extensive soft tissue damage. They were so nice, calling me “baby” and doting on my accent. My nurse said that I most likely had a severe strain or sprain and this time I wouldn’t be leaving without a method of mobilisation for my leg. Apparently these kind of injuries can be worse than a break– I guess that’s because it’s not a simple healing process. She said “I’m giving you a walking boot and trust me you’ll hate it.” I said “I don’t care I just want it to be fixed.” And so I and another nurse got to grips with how the boot worked and I was on my way back to my reality. It’s definitely something else to walk in. My friend Hannah from Keele who had a walking boot when I met her in first year said “you’ll become attached to your new foot. I miss mine.” I love Hannah, she has such a funny way of looking at things. When she heard that my injury was acquired after “overdoing it at the gym” she said to me “that’s the story of your life.” The sad thing is that it is. I wish I could have a normal metabolism. *Everything happens for a reason? 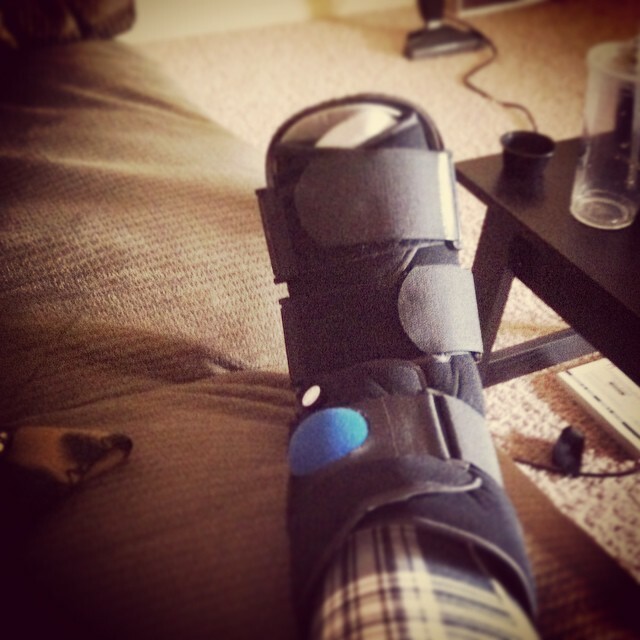 * I feel bionic wearing this boot. Trying to keep up with my friends as they walk has been a work out in itself, I’ve usually broken out in a sweat by the time I reach my destination. I really hope that it heals soon and that I can find a decent workout to do without my legs! Sigh for setbacks!